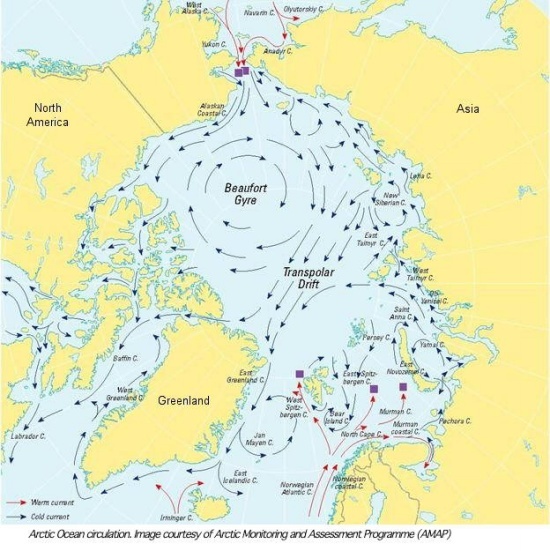 Paul Beckwith describes this most serious of positive feedbacks in which a reversal in the Beaufort Gyre means that rather than ice being taken via the Fram Strait into the Atlantic warm water from the Pacific is being taken into the Arctic Basin via the Bering Strait. As I walk through the seemingly endless hallways filled with poster displays of scientific observations and analysis on geophysical Earth topics (climatology, oceanography, natural hazards, hydrology, soils, rocks, etc. ), I discuss highlights on the Arctic and Antarctic sea-ice talks that I attended all morning. 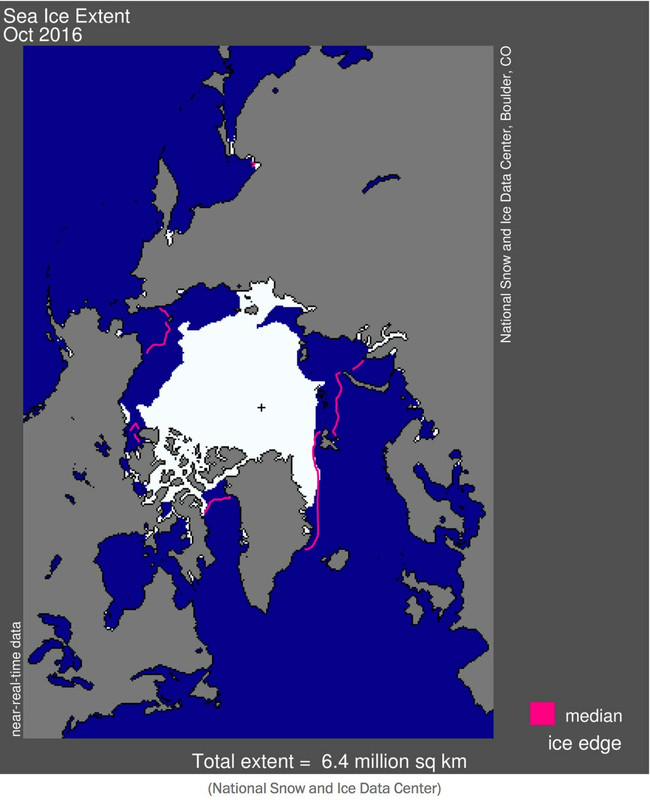 Most significantly, the Arctic’s Beaufort Gyre collapsed. This unprecedented event in late 2016/early 2017 occurred with rapidly declining sea-ice, letting ever increasing numbers of stronger storms from the Atlantic to enter the Arctic, bringing moisture and more warming. I knew that I had seen reference to this before so I went to Guy McPherson’s Climate-Change Summary and Update amongst the list of positive feedbacks. There's something special – and very counterintuitive – about the Arctic Ocean. Unlike in the Atlantic or Pacific, where the water becomes colder as it gets deeper, the Arctic water becomes warmer as it gets deeper. The reason is that warm, salty Atlantic-originating water that flows into the Arctic from the south is more dense, and so it nestles beneath a colder, fresher surface layer that is often capped by floating sea ice. This state of "stratification" makes the Arctic ocean unique, and means that waters don't simply grow colder as you travel farther northward – they also become inverted. But in a paper in Science released on Thursday, a team of Arctic scientists say this fundamental trait is now changing across a major part of the Arctic, in conjunction with a changing climate. "I first went to the Arctic in about 1969, and I've never seen anything like this," said Eddy Carmack, a researcher with Fisheries and Oceans Canada and one of the study's authors. "Back then we just assumed the Arctic is as it is and it will be that way forevermore. So what we're seeing in the last decade or so is quite remarkable." In a large area that they term the Eastern Eurasian basin – north of the Laptev and East Siberian seas, which in turn are north of Siberia – the researchers find that warm Atlantic water is increasingly pushing to the surface and melting floating sea ice. This mixing, they say, has not only contributed to thinner ice and more areas of open water that used to be ice covered, but is changing the state of Arctic waters in a process the study terms "Atlantification" – and these characteristics could soon spread across more of the Arctic ocean, changing it fundamentally. The study was led by Igor Polyakov of the University of Alaska Fairbanks, in collaboration with a team of 15 researchers from U.S., Canada, Russia, Poland, Germany and Norway. To understand the work, it's important to first note the extensive and rapid shrinkage of Arctic sea ice of late in an area to the north of Siberia. The area, known as the eastern Eurasian basin, is seeing thinner ice and more months of open water. Arctic sea ice is a linchpin of the Earth's climate system. Normally, one would presume that a warmer atmosphere, caused by global warming, is the reason for shrinking Arctic sea ice. But the new finds that the ocean is turning out to be just as big a factor in the Eastern Eurasian basin. The Atlantic waters are finding a way to push through to the top of the water column, especially in the winter. "There is heat stored in the Atlantic Water layer and it's basically inaccessible for mixing because of the much lighter fresh water on top," Femke de Jong, an oceanographer with the Netherlands Institute for Sea Research who was not part of the study, said in an email. "If this freshwater layer weakens or disappears (temporarily) like the authors show, the Atlantic Water can contribute (more) to ice melt." That's what the research found. Using moorings in open water, attached to ice, and also measurements from ships, the scientists found that the Atlantic layer is increasingly mixing up to the surface in this region, a phenomenon that may be driven by the decline of ice in a kind of feedback cycle. As ice declines, Carmack explains, winds and weather are more able to roil waters at the ocean surface. This promotes more mixing of the depths with the surface – bringing up more heat that's then capable of melting ice. Those changes are occurring across roughly a quarter of the deep Arctic ocean (the part that lies out beyond the continental shelves that encircle it). One key feature of the change is that a middle layer of the ocean in the Arctic dubbed the "halocline" – a cold layer below the fresher surface where the water's saltiness increases rapidly – is thinning and weakening. The halocline had previously served as a cap, preventing mixing between the cold fresh surface waters and warmer, saltier Atlantic waters – in essence preserving the distinct layers in the ocean. But that cap is now growing thinner, the research suggests. The result is that at least half of the sea ice decline in recent years in this region can be attributed to warm ocean waters climbing up from the depths, rather than to the warming atmosphere. However, the paper is not without criticism. One Arctic oceanographer who was not involved in the research, Andreas Muenchow of the University of Delaware, agreed with the overall results but suggested that it wasn't particularly big news to Arctic researchers. "It is basically just a geographic description of well-known ocean features that have moved north by north-east into the Arctic," he said in an email. Muenchow also said that the same process might not apply to other parts of the Arctic, closer to the United States and Canada. "For over 10 years we know that this causes thinner ice in the European, though not American sector where a strong halocline (salinity difference in vertical) prevents the Atlantic heat to reach the ice," he said by email. "In the European sector the (salty) Atlantic heat is very near the surface without the 'insulating' halocline that is fresh and very cold." Carmack agreed that "the other side of the Arctic that we call the Canadian basin, that's a different story. So you'll have to stay tuned in for that one." The new study does, though, suggest that the current region that features "Atlantification" may not be the last – the progression of this new composition of Arctic ocean should proceed eastward into new areas, at least for a time. "This whole thing about the ocean's role in sea ice retreat, it used to be minimal, but as sea ice retreats it's one of those positive feedback mechanisms," said Carmack. "And we're talking a lot of heat in the Atlantic layer, it could melt all the ice in the Arctic if it were to pop up to the surface."